All matter, including mineral crystals, is made up of atoms, and all atoms are made up of three main particles: protons, neutrons, and electrons. As summarized in Table 2.1, protons are positively charged, neutrons are uncharged and electrons are negatively charged. The negative charge of one electron balances the positive charge of one proton. Both protons and neutrons have a mass of 1, while electrons have almost no mass. The element hydrogen has the simplest atoms, each with just one proton and one electron. The proton forms the nucleus, while the electron orbits around it. All other elements have neutrons as well as protons in their nucleus, such as helium, which is depicted in Figure 2.2. The positively charged protons tend to repel each other, and the neutrons help to hold the nucleus together. The number of protons is the atomic number, and the number of protons plus neutrons is the atomic mass. For hydrogen, the atomic number is 1 because there is one proton and no neutrons. For helium, it is 4: two protons and two neutrons. For most of the 16 lightest elements (up to oxygen) the number of neutrons is equal to the number of protons. For most of the remaining elements, there are more neutrons than protons, because extra neutrons are needed to keep the nucleus together by overcoming the mutual repulsion of the increasing numbers of protons concentrated in a very small space. For example, silicon has 14 protons and 14 neutrons. Its atomic number is 14 and its atomic mass is 28. The most common isotope of uranium has 92 protons and 146 neutrons. Its atomic number is 92 and its atomic mass is 238 (92 + 146). Figure 2.2 A depiction of a helium atom. The dot in the middle is the nucleus, and the surrounding cloud represents where the two electrons might be at any time. The darker the shade, the more likely that an electron will be there. An angstrom (Å) is 10-10m . A femtometre (fm) is 10-15m. 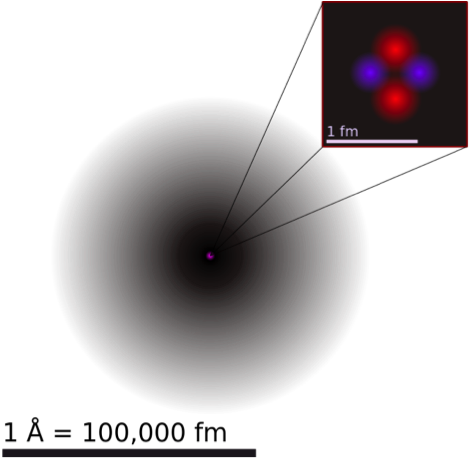 In other words, a helium atom’s electron cloud is about 100,000 times bigger than its nucleus. Electrons orbiting around the nucleus of an atom are arranged in shells — also known as “energy levels.” The first shell can hold only two electrons, while the next shell holds up to eight electrons. Subsequent shells can hold more electrons, but the outermost shell of any atom holds no more than eight electrons. The electrons in the outermost shell play an important role in bonding between atoms. Elements that have a full outer shell are inert in that they do not react with other elements to form compounds. They all appear in the far-right column of the periodic table: helium, neon, argon, etc. For elements that do not have a full outer shell, the outermost electrons can interact with the outermost electrons of nearby atoms to create chemical bonds. The electron shell configurations for 29 of the first 36 elements are listed in Table 2.2. 2.1 Electrons, Protons, Neutrons, and Atoms by Steven Earle is licensed under a Creative Commons Attribution 4.0 International License, except where otherwise noted.